Today (Thursday 29th December 2016) there were only three evening fixtures; Bari v SPAL, Aston Villa v Leeds United and Rotherham United v Burton Albion. All three went in-play on Betfair, so I fired up Team Stats to see what trading angles I could find. I used small £10 stakes to prove that even a small trading bank can return excellent profits. 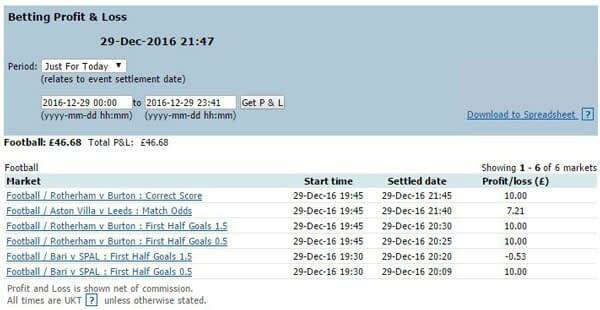 A little more than two hours after logging in to Betfair, I had made a profit of £46.68 (4.67pts). Of course, I didn't spend much time actually trading as most of it was spent watching Dexter on Netflix! With Team Stats, everyone is able to trade easily and with very little knowledge of the teams involved. I can promise you, my knowledge of Italy's Serie B could be written on the back of a postage stamp! In this post, I will explain exactly what I did and why. On a busy day, I profile fixtures of interest ahead of kick-off but there were only three to look at tonight. The Italian Serie B game between Bari and SPAL kicked off at 7.30pm, so that's where I started my research. From that information, I can decide which trading strategies offer the best risk/reward. This game was 9th v 3rd and Team Stats showed me that Bari had scored in 9/10 home games, while SPAL had scored in 8/10 away. I could also see that Bari had conceded in 6/10 home games and SPAL had conceded in 8/10 away. It looked like goals were on the horizon from those stats, but only 5/10 Bari home games had gone O2.5 goals and 3/10 SPAL away games. Even worse, only 1/10 had gone O3.5 goals for both teams. Clicking on the "Analyse" button in Team Stats, I could see that it was a similar story for Bari at home against top half teams and SPAL away against top half teams. Every Bari home game had gone O1.5 goals (even though the O2.5 and O3.5 stats were poor). Bari had scored in 9/10 home games (4/5 against top half teams). This put 1-1/2-0 scores firmly in my sights. Goal probability for the first half was 80% which is a decent number in any league. However, in Serie B that's a huge amount! Team Stats Trends showed me that 38.5% of Serie B games this season had been 0-0 at half-time against an average of 32.4%. The English Premier League, for example, is at 30.0%. From my initial profiling, I was expecting two goals with at least one of them in the first half and at least one for Bari. The second half goal probability was 82% which was a little higher than the first half, but not especially high for an average second half between two teams in the top half of the table. Of course, I had no interest in backing 1-1 or 2-0 from the start and definitely not O1.5 goals which wasn't even close to 1.50! The only thing to do was wait. After 20 minutes had been played I checked the in-play stats to find that there had been 1 corner and 1 shot. However, just 10 minutes later, those numbers had risen to 4 corners and 6 shots. With the game firing into life and that first half goal probability being so high, I was happy to lay U0.5 first half goals at 1.50 (1pt) and also U1.5 first half goals at 1.05 (1pt). On 36' SPAL scored from the penalty spot and I had almost 1pt of profit in the bag. A second goal before half-time would have doubled my profit, but wasn't to be this time. With Team Stats suggesting a Bari goal so strongly, my natural thought going into the second half was that they would equalise at some point. However, the BTS (Both Teams to Score) price was well under 2.00 and I didn't want to lay SPAL as high as 1.80; after all, they were 3rd in the league. 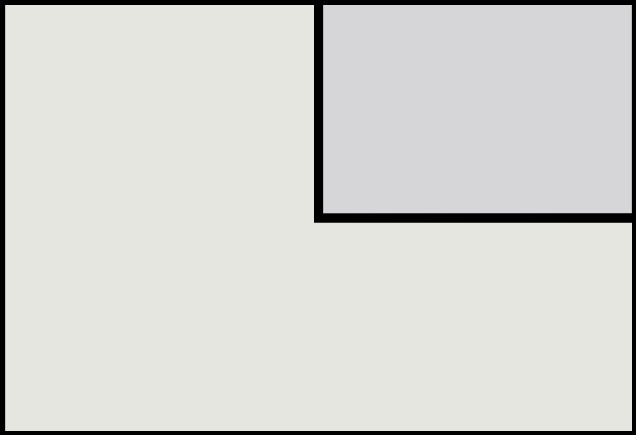 I decided to monitor the game and, after an hour of play, there had only been one more corner and shot. I had no interest in getting involved while the game was so quiet. Bari scored on 62' - a penalty - which was not the biggest surprise, but I had no regrets about keeping my profit safe. I know that making the correct decisions every time works in my favour long-term and a weak trade which wins is still a weak trade. Had the in-play stats supported what Team Stats was so strongly showing, then I would have been tempted but with a profit already secured I didn't need to risk a thing. I will never run out of fixtures to trade and patience pays off in the long run. The game ended 1-1 which was an exact fit for the type of score which Team Stats had identified. 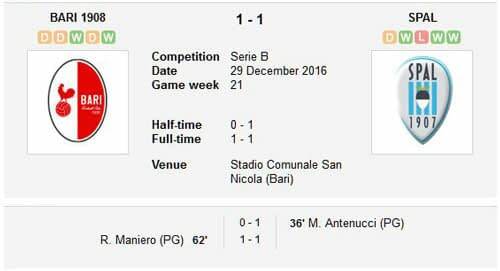 This was the second fixture of the night and it kicked off 15 minutes after the Italian game at Bari. Villa had scored in every home game this season, but the first half goal probability was low at 62%. Clicking on the Team Stats "Analyse" button, it was even lower at just 33%. I considered backing the half-time 0-0, but I much prefer going for goals rather than wishing them away. 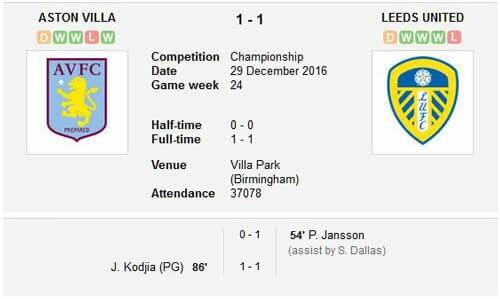 Team Stats showed me that Villa had not had a 0-0 at home, nor Leeds away. However, only 45% of Villa home games and Leeds away games had gone over 2.5 goals. Even worse, no Villa home games against top half teams had gone over 2.5 goals and only 25% of Leeds away games had gone over. In contrast, "Daily Best Bets" over on our Trade Your Bets site showed plenty of value on the away win. In order to make a profit I didn't need Leeds to actually win the game, but be in front at some point. The Team Stats "Goal Patterns" page showed me that Villa had scored first in 8/11 home games, while Leeds had scored first in 5/11 away so it didn't look too promising, however Leeds were 5th in the table and had won 4 of their last 5 away. Leeds were available to back at 4.20. At such a high price, I only need 1 of 4 similar selections to win and I'm in profit overall. Daily Best Bets has been flying this season, so I trusted the value algorithm and backed Leeds at 4.20 for 0.5pt. 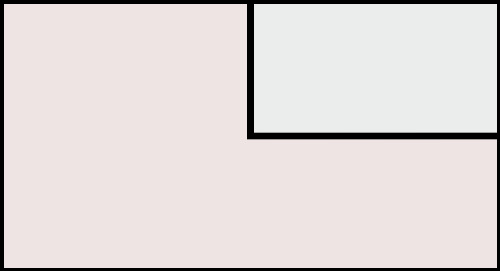 After 20 minutes there had been just 1 corner and 3 shots, then 10 minutes later it was exactly the same number. From those sort of numbers, it wasn't hard to see why the first half goal probability was so low! By half-time there had been 3 corners and 7 shots which was better, but not enough to tempt me into any other type of trade. Had I backed the half-time 0-0 I would have had a profit, but trading is easy in hindsight! Leeds went in front on 54' and I immediately traded out at 1.67, locking in 0.72pt profit (141% ROI). I was delighted with that! "Goal Patterns" showed me that Villa had gone behind 3 times at home this season and all of them went 1-1, but that Leeds had taken the lead 5 times away and none of them had gone 1-1 (4/5 went 0-2). Conflicting stats there, but Villa had scored in every home game so I looked to the in-play numbers for guidance. After 70 minutes, Villa were trailing the corner count 2-5 but this was up to 4-5 10 minutes later. In terms of shots, Villa were level at 6-6 on 70 minutes but trailed 7-8 after 80 minutes had been played. Not the sort of numbers which indicated that Villa were attacking hard and I decided to hang on to my profit rather than risk giving it back. Villa scored a penalty on 86' so I could have boosted my profit, but I was very happy with my decision. The game ended 1-1 which, again, was right in line with what Team Stats suggested. However, because Leeds scored first, I was able to lock in a very nice profit. ​Had I not had the insight of Daily Best Bets, I would have almost certainly trusted Villa's home record more and layed under 1.5 goals late in the game to land a profit that way. This was the third fixture of the night and the least predictable. It was an interesting bottom-of-the-table clash and certainly one which Rotherham would have targeted as being winnable. They had scored in 9/11 at home, while Burton had conceded in 11/12 away. 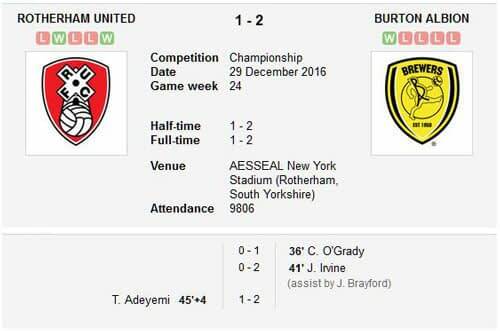 Burton had scored in 8/12 away and Rotherham had only kept 2 clean sheets at home, so every chance of at least one goal for each team. The Team Stats "Analyse" button showed an even stronger position, with Rotherham scoring in 8/8 at home to bottom half teams and Burton scoring in 5/7 away. Rotherham had only kept 2/8 clean sheets at home to bottom half teams, Burton only 1/7 away. Over/Under goal stats were stronger for Rotherham at home to bottom half teams too. 64% of their total home games had gone over 2.5 goals but, against bottom half teams, that rose to 75%. And the 45% which had gone over 3.5 goals rose to 63%. Burton's goal stats were not as strong, but 11/12 away games had had at least 2 goals and that's always a good base number of goals to trade from. From my profiling, there was a strong chance of both teams scoring. From there, it looked very possible for a third and perhaps fourth goal, but impossible to call which team would end up with the win. I let the game kick off and saw that after 20 minutes there had been 4 corners and 6 shots. This was exactly what I wanted to see; attacking play rather than a cagey affair with both teams more concerned with 'not losing'. Coupled with the history of goals I had seen in Team Stats, I was confident enough to open a "CS4" trade by backing the target scores for a total of 1pt ("CS4" is one of our correct score trading strategies). Because I had waited, the prices had risen nicely and I was able to place more profit on the target scores for the same liability than I would have had if I'd gone in from the start. By this time, there had been a goal in the Bari v SPAL game so I had a profit already secured there, with the possibility of a second before half-time. 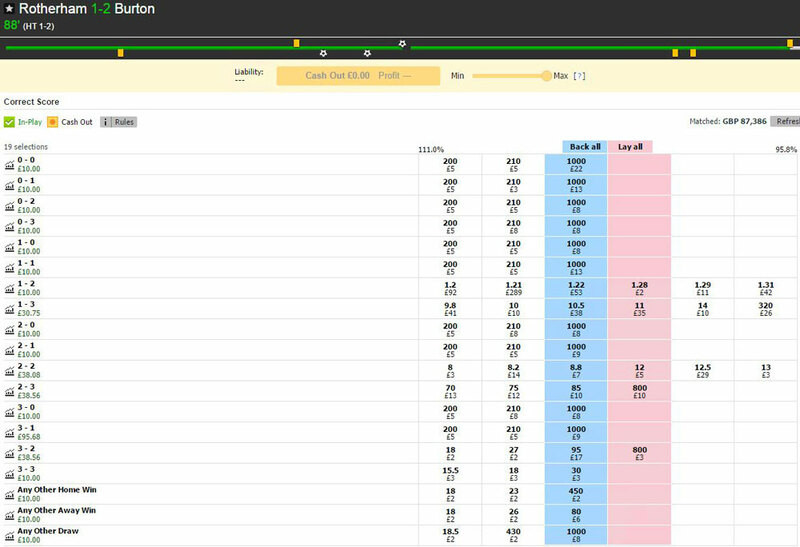 My away win trade at Aston Villa was also running, but more than covered even if it lost. At this point of the evening, my worst case scenario was a loss of 0.5pt if everything went wrong. After 30 minutes had been played, there had been another couple of shots on goal. First half goal probability was 73%, but a much higher 89% when checking the Team Stats "Analyse" button (which puts stats into better context). I decided to lay U0.5 first half goals at 1.45 and U1.5 first half goals at 1.05 for 1pt each. It added 0.5pt liability to my overall position, but one goal before half-time would mean I was in pretty much a no-lose position. Bari v SPAL was now at half-time so I knew my profit there, plus Villa was 0-0 with nothing much happening. My worst case scenario was still only 1pt but the upside from a first half goal here would be significant. Burton scored on 36' and again on 41' to land both profits, so that covered my correct score trade and guaranteed me 1pt profit no matter what else happened. There was even time for a third goal before the break, which got Rotherham back into the game. During half-time, I layed profit from 1-3 and 2-2 (0.5pt each) so that my correct score trade was scratch (no profit or loss) and that meant my 2pts return from the first half was in the bank as profit. My overall position for the evening was now almost 3pts profit in the bank (a little under 1pt at Bari and 2pts at Rotherham), another profit if Leeds score first and more green with a fourth goal at Rotherham. All the hard work was done and it was now a case of maximising profit as best I could. I had a lot more profit waiting for a fourth goal, but neither team could hit the back of the net again, despite plenty of shots on goal. In fact, by 80' there had been 11 shots in the second half alone. At that point, I decided to lay more profit from 1-3 and 2-2 in order to guarantee 1pt profit from the correct score trade to go with all the others. Rotherham were chasing the game and, if a fourth goal had been scored, I would have added another 2+pts profit to what I already had. The game ended 1-2 for a total of 3pts profit. Both teams did score as Team Stats had suggested and I was just one goal short of a big green. £46.68 is a terrific return for such small stakes (monthly subscription more than covered) and I spent most of the time watching Netflix. Trading simply doesn't take very long at all. Even if I'd been called away, it wouldn't have been a problem. The only trades which needed attention were the correct score at Rotherham and away win at Villa. I could have left them alone and still made £29.50 profit. Trading is very flexible and, with the instant knowledge which Team Stats offers, incredibly simple. Make good decisions, rinse and repeat. That's all there is to it. Nope, we don't share email addresses with anyone. Interesting and good read. You mention you use Team Stats to compare the teams form etc. Where do you get these team stats from? We built our own Team Stats software as many of the stats we need for trading are not available anywhere else.